Chevrolet’s iconic pony car got its new version released at the Frankfurt Motor Show 2015. The lightweight sportier model is loaded with features, power and comfort in a compact model and is speculated to run the entire automotive market upside down with its offerings. 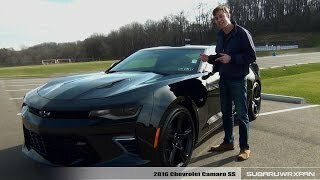 Let us have a look at the review of Chevrolet Camaro 2016 to know how far the speculations are true. 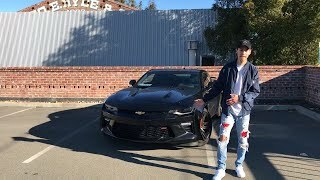 The interior of Chevrolet Camaro 2016 though received a redesign but it still can be matched with the Camaro factors which I believe is a positive sign. The instrument panel is almost similar in the standard version but buyers do have an option to switch for an eight-inch HD screen which can be configured to provide you vital information like performance and navigation and other infotainment details. There is one more eight-inch screen housed right in the center of the dashboard featuring the next-generation MyLink system. The dash has been made to look cleaner and controls easily accessible by housing right beneath the screen. The cluster of these controls also gets the company of heating and cooling air ducts. Another new element for this version is the all new electronic parking brake which gets replaced by the predecessors mechanical parking handle brake resulting in new position of the cup holders. 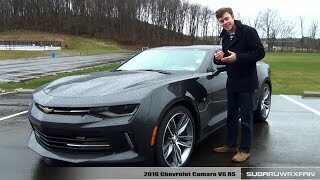 In all rounding up the interior of Chevrolet Camaro 2016 I would say, its spacious, innovative and tech featured. The exterior of Chevrolet Camaro 2016 is an overhaul in comparison to the predecessors. Though not much can be noticed but a closer view will highlight a lot of changes. Starting with the front fascia you have a newly designed mesh for the grille sitting proudly amidst the LED headlamps. The bumper gets new larger air intakes while the trapezoidal gap beneath uses the same mesh pattern as we saw in grille. Moving towards the rear end we have a commendably sculpted bumper that adds to the bit of aggression and also a new set of taillights to compliment it. Beneath there is a black diffuser like piece which is lot thinner as in comparison to the predecessor. 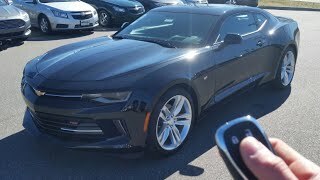 In all the exterior of Chevrolet Camaro 2016 has a sculpted body, aggressive design yet the blend of luxury to steal the gleam. 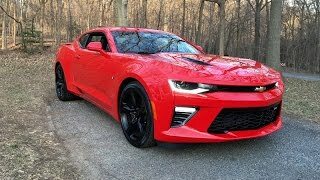 Beneath the hood of Chevrolet Camaro 2016 are three engine options; first is a 2.0 liter Turbo generating total output of 275 hp and peak torque of 400 nm, second is a 3.6 liter V6 producing 335 hp and peak torque of 385 nm while the last one is a massive 6.2 liter V8 cranking 455 hp and peak torque of 617 nm. All of these engines can be had with any of the Six-speed manual or an eight-speed automatic transmission with paddle shifter being mounted behind the steering wheel. The performance figures of Chevrolet Camaro 2016 are not yet unveiled but we assure you to share them as early as company unveils the details.